A blog is a very important tool to stay in touch with your customers, it aids you in sharing content that is useful for them and it can also help you increase your customer base. In this article we would like to walk you through the steps on how to create your blog. So let’s dig in. You can create multiple blogs via Soldigo. For example you can create a blog to tell your story, to keep a business diary and you can create another one for your event calendar and so on. In order to access Soldigo’s blogging platform, click the “Content” menu’s “Blog” submenu on your Dashboard. To start a blog, fill in the form that will appear by click the “Create new Blog” button. 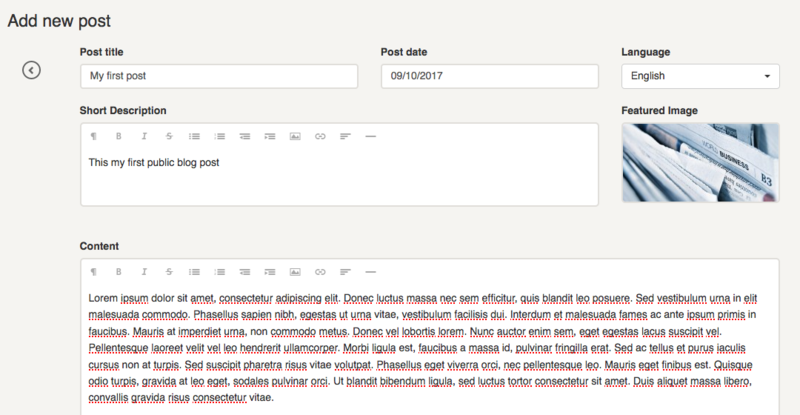 Add the blog title and the status of the blog. If you have a multilingual store, you will have to select the language of the blog as well. By clicking the “Save blog” button you will save your blog and you will be redirected to your blog list. The blog list will contain all the blogs you created until now. To edit or delete a blog, click the icons on the Manage column. Add a title to your blog post and don’t be afraid to be creative. Choose a post date and if you have a multilingual store, then also the language of the post. Sum up your post in the short description that will appear in search engine results as well. Choose a featured image and fill in the content of your post. At the end, add your post’s tags and choose the status of the post and click Save. Don’t forget to share it on your social media so it will be read by all your followers and more! To access a blog list, click the title of the blog on your blog list. By doing so, you will list all posts in that particular blog. To edit or delete a post use the icons in the Manage column.